We’ll be ringing in Sir Laurence Olivier’s 105th birthday on May 22nd, and what better way to celebrate than by giving away a special present representing his finest work? One lucky winner will receive the fabulous goodies pictured above! *This DVD is region 2, which means it will only play in a European or region-free DVD player. This contest is open to participants world-wide. To enter, leave a comment below saying what your favorite Laurence Olivier film is and why. Comments without the why bit or a valid email address will be ineligible. As usual, participants can earn an extra entry for promoting vivandlarry.com on Facebook, Twitter, or your blog. Don’t forget to post a link to where you’ve promoted! Contest ends May 31, 2012 and the winner will be chosen via the random number generator and notified by email. This does not qualify for the contest, and admittedly it is a bizarre choice, but my favourite Laurence Olivier work is his narration for the 26-episode documentary series, “World at War”. The use of pathos and cynicism in his voice, as well as the rare bit of humour could not be more perfect. The script and the footage are fascinating, but it is Olivier’s voice that make it the definitive documentary of WWII. The World at War is indeed a fantastic documentary made all the more poignant by Olivier’s gravitas. This can still qualify for the contest if you want it to since technically it is an Olivier film. I’ll go with Wuthering Heights, as it’s a perfect example of the Hollywood Dream Factory in its greatest year. I’ve watched That Hamilton Woman/Lady Hamilton more often, but that’s Vivien’s film (as the title indicates). Perhaps his Hurstwood in Carrie is Olivier’s best film performance (or is that the influence of David Shipman’s entry on him in The Great Movie Stars lingering and lingering?). Olivier’s rock star Hamlet (before there were rock stars) also remains a favorite. It’s his Heathcliff, however, who gives us that extra shiver of excitement. I truly love most of what Mr Olivier did but the film I find most interesting for him is the 1960 film “The entertainer” playing Archie Rice it was such a different role for him and from what we were used to seeing…not a classical role in the sense of the word… he was almost unrecognizable as Archie we also get to hear him sing!! !…I believe the part was written for him by John Osbourne I just think he was fantastic in it. It must be hard to play a man who thinks he is so funny and yet he isn’t. 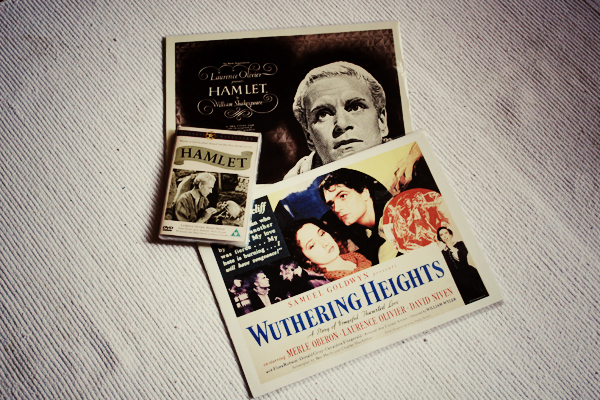 My personal favorite Laurence Olivier movie would have to be Wuthering Heights. I have fond memories watching it with my mom when I was young, and besides his performance, (which is awesome) this is definitely the film I find him the most handsome in. (Haha.) Beyond that though, I’ve watched many of his films, and no matter how many I see, Wuthering Heights will always be the first. Hard to believe Laurence Olivier would have been 105 . Amazing. I think of course he was one of the greatest actors if not the greatest of our time. My favorite fulm is Fire Over England because it showcased the growing passion between him and Vivien. Their almost scret love was palpable just by watching the way they looked at each other . Rebecca. Because of George Fortescue Maximilian de Winter and his funny name. Because he lived in Manderley, one of the most romantic place of the world. Because his wife had drowned in the baye. Because one year after Wuthering Heights, LO could play a man in his late 40’s, early 50’s, in elegant tweed, having grown a mustache. Because Vivien Leigh hoped to play the white mouse but finally didn’t. Because of Gladys Cooper dressed as a Walkyrie. Because of the dark corridors and the depressive spaniel. Because of the portrait and the dress at the ball. Because of black and white fury. The perfume of the rain in the azaleas. Because of the boat lost at see and the hut by the cove. Because Jack Favell called Mrs Denvers “Danny”. Because I learnt the beginning of the novel at school and still remember it : “Someone tall, dressed in black, came toward me and I held out my hand. This is Mrs Denvers, said Maxim taking off his gloves…” Because of Hitchock and Alfred Newman’s score. Because of Mrs Van Hopper saying “C’est la vie !” and “Tennis lessons, my foot !” And because when filming Hamlet, LO would remember the roaring sea and the view from the cliff… Rebecca. My favorite film and story. Even though Laurence Olivier speaks of his role in Shakespeare’s magnificent tragedy of Hamlet as his favorite one, saying “Pound for pound, in my opinion, the greatest play ever written.. I’ll never play him again, of course, but by God, I wish I could.”, I would rather go with his role of Heathcliff in Wuthering Heights. The role of Heathcliff was indeed a demanding role, due to the fact that he wasn’t in a good relationship with Merle Oberon who played Heathcliff’s beloved Cathy, and still – he played the role in such a convincing manner that he gave his role a true personality. In his book “On acting”, Laurence says, “Merle and I had been spitting at each other all day, in real hate, and he (referring to the director William Wyler) suddenly made us do a love scene, which went beautifully in one take.” This proves Larence’s true dedication to acting – It is easy to do beautifully what you love, but it is a true skill to do beautifully something that you don’t love and even hate! Laurence managed to conquer his real feelings and by repressing them, managed to become Bronte’s main character with all his emotions. Laurence Olivier was at the same time handsome and desirable, and arrogant and repulsive – a fatal demon, and a fatally attractive man in a sense – a Heathcliff that, as such, will never appear in a movie again. Still, Sir Laurence’s Heathcliff was majestic, with a stunning “harshly smooth” accent and such persuadable facial expressions, picturing a fearless Byronic hero suffering because of his bitter love, exactly as Heahcliff was supposed to be! Wuthering Heights! The book and the movie are my ALL time number one favorites! I named my first daughter Catherine Emily because of this book. I love Laurence Olivier and everything is he in. I have an 8×10 glossy of him on my night stand. I have loved him since I was 13 when I first discovered Wuthering Heights in my school library. When I brought the book home my dad asked if I had seen the movie and I said no, so he rented it for me and it was love at first sight. Ever since I drink in every piece of work that he is in. My first thought was “Wuthering Heights”, but I don’t want to cry every single time I watch my “favourite”. I adore Lord Larry’s work in “The Boys From Brazil” because that movie could have been a mess full of charactatures. It wasn’t. I could easily say “The Entertainer”. After hearing and reading how I would hate Archie Rice…I didn’t. Handsome, young eager Larry in “Fire Over England” is always a treat. Larry’s “Hamlet” will never be bested. But when it comes down to it I must say “Pride and Prejudice”. Yes, they were too old. Yes, the costumes were off. But they were saying Austen words. And that supporting cast! And Mr Darcy had so many layers. So many wonderful Larry layers. I’ve see every movie version and I like them all. It’s the romantic in me. But Larry and Greer in Hollywood in 1940 is my favourite. That Hamilton Woman. Because it’s one of my favourite films of all time. Because I adore the Oliviers. Because of “Nelson in Love’ scene. Saw this at about 7 years old and never got over it. The deathscene tore me apart and something about his eyes. . . But I wish I’d seen more of his stage performances: Saw 2 Beckets w LKO in both parts, and Merchant of Venice which seemed too mannered. His mannerisms took over in his later work, I think — what a loss. Haha, my favorite movie would have to be Wuthering Heights because I watched that bloody movie so many times (Actually that is the movie I have watched the most in one sitting.) Also, it’s just his setting, you know? He was able to do this thing and be hot at it. Merle Oberon was lovely as well and I also just love the book as well. promoted it on my tumblr page! Happy birthday Larry boy! My favorite film of Larry’s is Rebecca. The first time I saw him enter the hotel lobby, it took my breath away. OMG, was he hot! I especially like the scene in the boat house. The chemistry between Larry and Joan Fontaine was amazing. Great directing by Hitch. I’ll have to say Rebecca. After reading the book so many times, I had to watch the film. It was the first time I had ever seen Laurence Olivier and I’ll always remember how close I sat next to my TV. I dragged my gran to the library so I could get out all of his films. This contest is now closed and the winner has been notified. Thanks for playing, everyone!